We have had many many successes with our clients and their dogs! We love sharing those successes with you. Scroll down below and click on a story to learn more! We love to share the accomplishments of our hard work in dog training, whether it be obedience dog training, dog aggression training, or dog boot camp training in Los Angeles, Ventura, Santa Barbara, Sacramento, San Francisco, The Bay Area, San Diego, Las Vegas, or one of the many qualified dog trainers we recommend throughout the United States. We are adding some of our cases below for you to read and possibly connect with. Below a list that you can click on for more information and more reading. We hope you enjoy reading about our past clients. Feel free to contact us if you have any dog training questions or would like to get your dog started. Thank you and we look forward to speaking to you! ISO & Penelope are a German Shepherd Dog and Pit Bull that came to our dog board & training program from Ventura to work on some dog aggression issues they were having. Due to their aggression, it was becoming increasingly difficult to even walk the dogs around the block. Both ISO and Penelope did very well in their training and they off to a great start in their new behaviors. Thor is a Great Dane from Antioch, CA 94531. He came to us for dog aggression training dog boot camp program. He is a cute and sweet, but he can also be very stubborn and often wants things his way and only his way. Thor, at times, was extremely anxious and possessive over his owners. Kobe is a Miniature Pinscher from Manhattan Beach, Los Angeles, California 90026. This handsome guy has been boarding with us for years, and we love when he comes to visit. He was shy and a little bit nervous the first time he came, but he warmed up to us in no time. Mowgli is an awesome big guy from the beachfront city of Santa Monica, Ca 90405, one of the many cities we offer our dog aggression training and doggy boot camp programs to. Mowgli was sent to us at K-9 Behavior Services for our doggy boot camp program to learn some basic obedience. ​Connor is a Husky/Pit mix in training for dog boot camp and dog aggression training, Woodland Hills, in Los Angeles, Ca 91364. Connor’s owners had previously sent one of their dogs to us at K-9 Behavior Services, so they knew they could count on us to help Connor with his aggression issue. Doggy Boot Camp In Santa Clarita, Simi Valley, Camarillo, Moorpark, Ojai, And Beyond. Dog Boot Camp Is Now Also Offerred In Sacramento, San Francisco Bay Area, Stockton, Modesto, And San Jose Area, Folsom, El Dorado, Orangevale, Fair Oaks, Roseville, Rocklin, Loomis, Carmichael, and Citrus Heights, Miami, Florida, Miami-Dade County, Broward County, Palm Beach County. ​Minnie is a cute and energetic French Bulldog from the community of Northridge in Los Angeles, CA 91324. She came to us for our dog aggression training program. She is small, but very muscular, and she didn’t like anything or anyone getting too close to her. ​Otis & Laney are two adorable little Frenchies from Los Angeles, Ca, 90035. Otis is a 7 month old male French Bulldog, and Laney is a 7 year old female French Bulldog. Otis & Laney came to us at K-9 Behavior Services for our dog boot camp program and our dog aggression program. Max & Alex are a handsome pair of gentlemen from Sherman Oaks, Ca 91423. 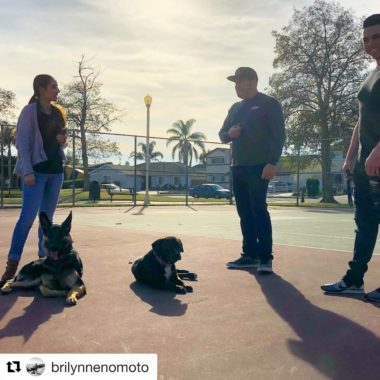 K-9 Behavior Services is in close proximity to the greater Los Angeles area, and often called for dog boot camps and dog aggression training from residents in the San Fernando Valley. There are a lot of unqualified and wannabe dog trainers out there creating franchises that offer poor dog training. Take a look at trainer’s credentials, experience, and references. Talk to past and current clients. Ask a lot of questions. A good dog trainer in the Los Angeles, Ventura, Santa Barbara, San Diego, La Jolla, Del Mar, Oceanside, Little Italy area should be willing to take some time with you and make you feel comfortable with him prior to you dropping your hard earned money. Feel free to call us and ask any questions you might have. Thank you. Luna is a beautiful female Gerberian Shepsky from the city of Thousand Oaks, in the Ventura County of California 91319. A Gerberian Shepsky is a mix between a German Shepherd and a Siberian Husky. She came to us at K-9 Behavior Services at 9 months old, and full of energy! 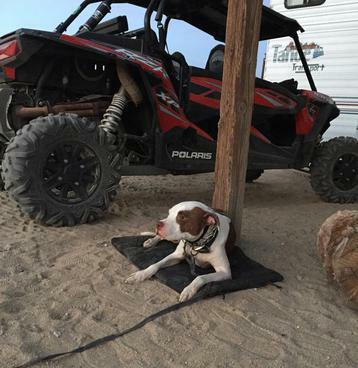 Fernie is a beautiful Pit Bull from Los Angeles, CA 90024. He came to us for our obedience and dog aggression training dog boot camp program. He is a cute and sweet dog, but he can also be very aggressive with strangers and often wants things his way and only his way. This doggy boot camp is offered in other cities such as Las Vegas, Henderson, Boulder City, San Diego, Del Mar, La Jolla, Oceanside, Little Italy, Santee, Miami, Palm Beach, Broward, Miami Dade, Boca Raton, Sacramento, the Bay Area, and San Francisco. Rex is a beautiful German Shepherd from La Crescenta, CA 91214. He came to us for our obedience and mild territorial dog aggression training dog boot camp program. He is a cute and sweet dog, but he can also be very stubborn and often wants things his way and only his way. Dixie is a lovable Australian Cattle Dog from Hollywood, in Los Angeles, California, 90028. She came to us for our dog aggression training program. Dixie is a nice, loving dog with her owners, but when people walk by their house, with or without dogs, she let them know it was her territory.